I think Mr. Pratchett would have enjoyed this. Being somewhat of a fan of Discworld(I played the two video games for the PC and read Mort) I am saddened that we lost Terry. He wrote some funny stuff with fantasy. I have a feeling Death is going to be kind to him in the afterlife. To paraphrase one of his characters, "He didn't die. He just left early." A fine tribute. A little less magic left in the world today. Safe travels, Sir Terry. We keep losing the good ones, the ones we can't afford to lose... 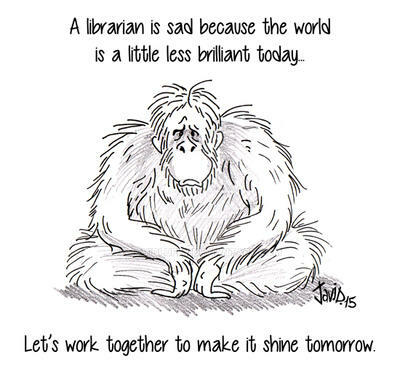 I'm also a librarian - thank you for this. You speak for me also, if that's all right.